The goal of Supporting Seira Stitch-by-Stitch (or the 4S project) is to raise funds to purchase sewing machines for each of the 11 churches of the Seira Community Church of Rwanda. These churches are in predominantly poor rural villages without running water, some with no electricity or minimal at best. Unemployment runs high as well as hunger, AIDS, and parasitic illnesses. To raise money in their cooperatives so they can buy sewing machines. 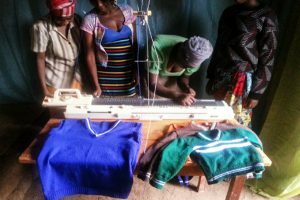 It’s a simple plan… to teach those who can’t sew how to sew, make items to sell, including mandatory school uniforms, and then purchase more machines and material. A portion of the proceeds for their family, a portion for the church, a portion for their cooperative. The cost of the machines, which are manufactured in Rwanda, is between $150 and $250 dollars depending on the type of pedal machines. So for roughly $400.00 per church, these women could start their businesses and qualify for a government loan.